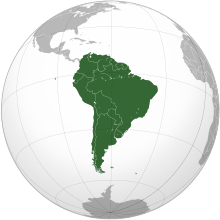 South America is a continent situated in the western hemisphere and, mostly, the southern hemisphere, bordered on the west by the Pacific Ocean and on the north and east by the Atlantic Ocean; North America and the Caribbean Sea lie to the northwest. As part of the Americas like North America, South America is named after Amerigo Vespucci, who was the first European to suggest that the Americas were not the East Indies, but a New World unknown to Europeans. South America has an area of 17,840,000 km² (6,890,000 sq mi), or almost 3.5% of the Earth's surface. As of 2005, its population was estimated at more than 371,000,000. South America ranks fourth in area (after Asia, Africa, and North America) and fifth in population (after Asia, Africa, Europe, and North America). Español América del Sur, también llamado Sudamérica o Suramérica, es un subcontinente atravesado por la línea ecuatorial, con la mayor parte de su área en el Hemisferio Sur. Está situado entre el Océano Pacífico y el Océano Atlántico. Alternativamente, en algunos países de habla no hispana se considera un continente. Português A América do Sul é um subcontinente que compreende a porção meridional das Américas. Sua extensão é de 17.819.100 km², abrangendo 12% da superfície terrestre, porém só tem 6% da população mundial. Une-se a América Central, ao norte, pelo istmo/canal do Panamá. Tem uma extensão de 7.400 km desde o mar do Caribe até o cabo de Hornos. More images South America - South America (Category). This section holds a short summary of the history of the area of present-day South America, illustrated with maps, including historical maps of former countries and empires that included present-day South America.